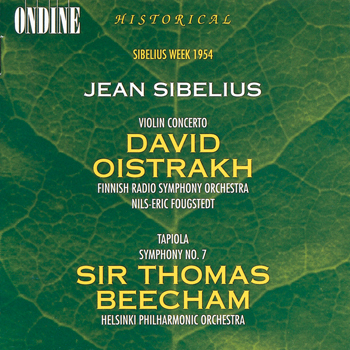 The full-bodied, voluptuous sound of Oistrakh's violin in this historic recording from the "Sibelius Week" is dazzlingly beautiful. (...) Beecham's live performance of Tapiola, Sibelius's orchestral testament, is equal to his ideal studio recording for EMI. (...) a stunning interpretation of the Seventh Symphony. This CD combines three essential works by the great Finnish composer Sibelius, in live-captured historic performances from the Sibelius Week 1954 in Helsinki. The predecessor of the renowned Helsinki Festival attracted legendary musicians to Finland, such as violinist David Oistrakh and conductor Sir Thomas Beecham. The mono recordings by the Finnish Broadcasting Company have been digitally remastered (ADD).